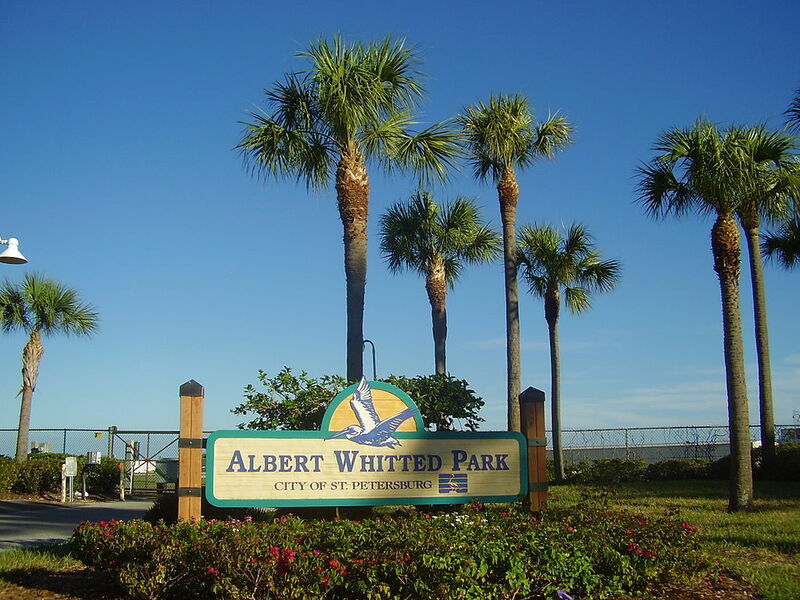 Albert Whitted Park on St. Pete's waterfront. 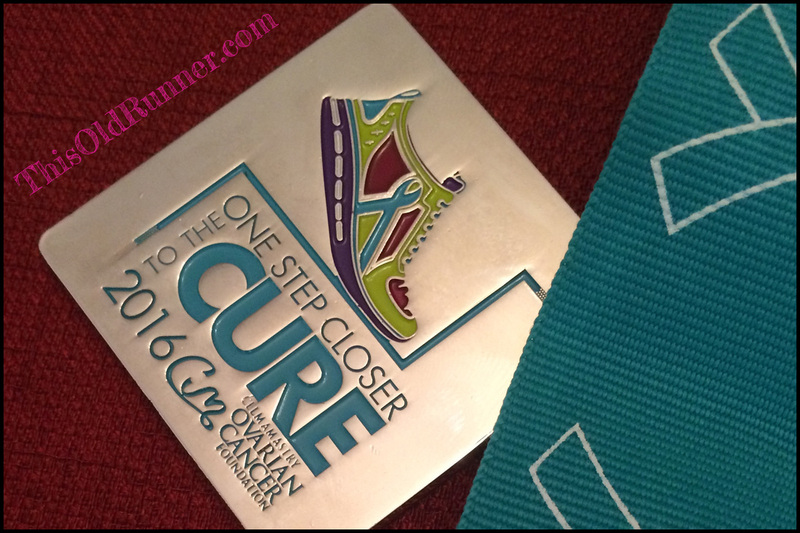 The One Step Closer to the Cure races began in 2011 to raise funds for the Celma Mastry Ovarian Cancer Foundation. (CMOCF). The race takes place in mid-September along the waterfront in downtown St. Petersburg, FL. Events include a 5K, a 10K and a 1 Mile Fun Run. Walkers are welcome. Ovarian Cancer survivors and patients are honored during the 1 miler and in a special Survivor Tent. Packet Pickup: Yes. Packet pick up and registration was available at 4 different St. Petersburg locations during the week before the event. Race day pick up was available. 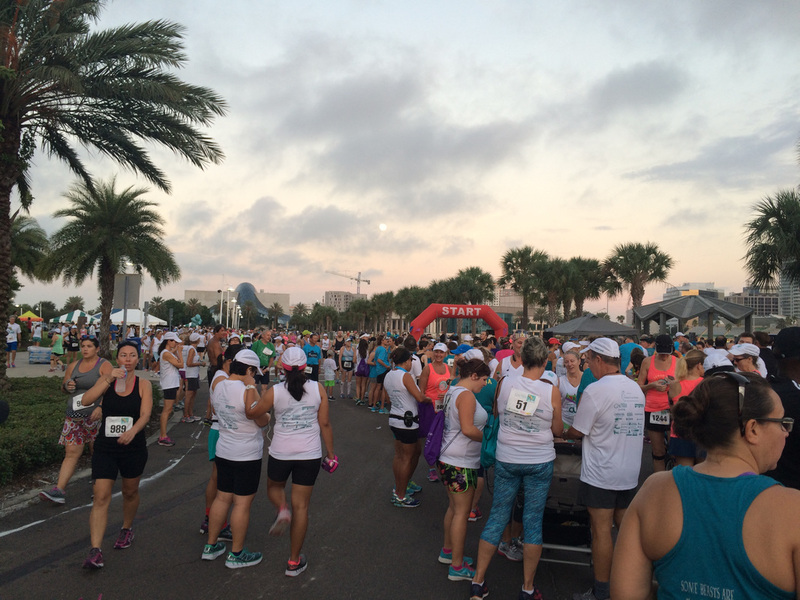 Race Course: 5K, 10K and One Miler all began at Albert Whitted Park. The park is next to a small airport, and across the street from the world famous Salvador Dali museum. The race route took runners all along the downtown waterfront. 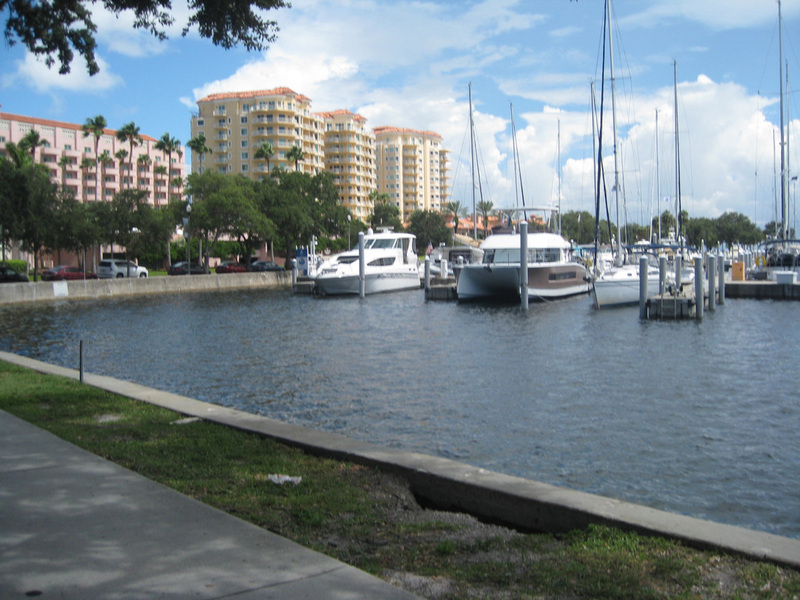 Lovely views of the yacht basin, waterfront parks, and the charming Snell Isle neighborhood. We ran on city streets past the Museum of Fine Arts, the History Museum, Vinoy Renaissance Hotel, and North Shore Pool. It was a flat course except for the incline on the Snell Isle Bridge. Aid Stations: Yes. Water every 1.5 miles. That was one water stop for 5k and 3 for the 10k. The water was ice cold, which was wonderful on a very hot and humid morning. Parking: Parking was FREE at the Mahaffey Theater parking garage on race morning. The garage is directly across the street from the starting line. On street parking and other parking lots were available in the downtown area. No parking at Albert Whitted Park on race day. Cost: Depends on when you register. All Races were Free for Ovarian Cancer Survivors and Patients. SWAG (Stuff we all get): White sleeveless tech shirt with colorful logo on front and sponsors on the back. Tech hat with ventilation slits. Samples, pens, notepads, drawstring bag, coolie cup and stick on card holder. Discount coupons for local running stores. Happy Surprise: Ice cold water at all the water stops was wonderful on a day with 90% humidity! Tons of cold water at the finish line. Just reaching into icy cold water to grab a bottle of water was refreshing. Post Race Festivities: Finishers were handed a medal, and then found cold water bottles a couple of steps past the finish line. There was a big shady tent set up on the lawn. There were bagels, bananas, granola bars, chocolate milk, water, Gatorade, and a variety of sodas available for runners. Several sponsors gave away promotional items: water bottles, sunscreen, hair ties, etc. Everyone was friendly and helpful. There was a guitarist and lots of folding chairs under the tent. There was a Survivors Tent next to the big tent. There was a bounce house and a pony to entertain children. The One Mile Fun Run/Walk to honor cancer survivors began at 10 am. 5k and 10k participants were encouraged to run. Photos: Yes. They were available on the Celma Mastry Ovarian Cancer Foundation website a few days after the race. I saw a photographer twice on the race course. Awards: The Team Award is given to the team with the most participants. I think the largest team had 85 members. There were also individual awards for the 5k and 10k. Timing Chip: Yes. The chip was on the race bib. Digital display at the finish line. There was a glitch with the chip software which delayed some results until Tuesday. Race results posted at www.coolrunning.com. Weather Report: September is hot in Florida. The breeze from the waterfront helped, but it was very warm. Everyone was soaking wet with sweat at the finish. Runners saw a full moon just before the sunrise. The 10K ran along the waterfront from Albert Whitted Park to Snell Isle and back. The 5k route, also an out and back, went to Vinoy Park, then returned to Albert Whitted Park. Lots of sponsors meant lots of goodies for runners. 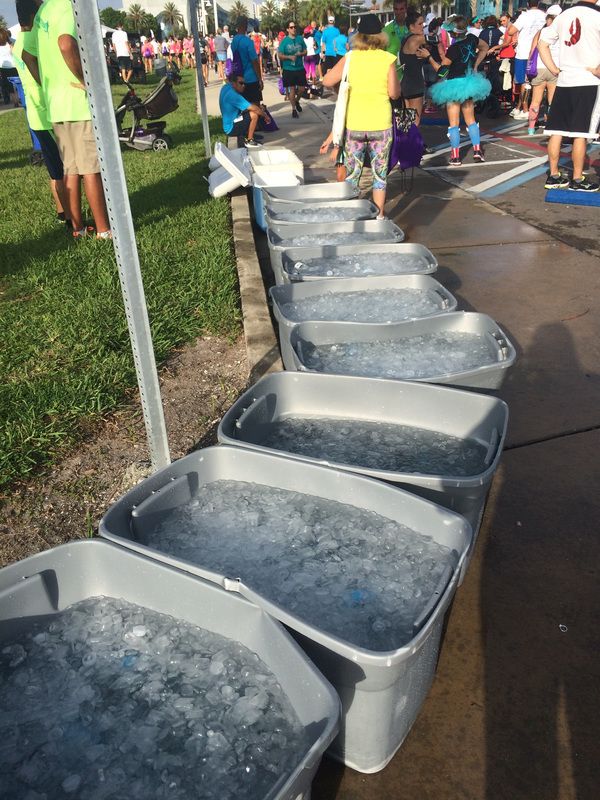 There was plenty of cold, cold water for all the runners during and after the races. 5K and 10K finishers wait for the One Mile Run to begin. Running St. Pete's waterfront gave participants a nice view, plus a slight cooling breeze off the water. My plan was to run slow and steady, somewhere near a 12 minute pace. I felt acclimated to the heat, but planned to run/walk if the humidity was oppressive. This race falls a couple of weeks before my true season, so I considered it a training run — a way to get back into race mode. 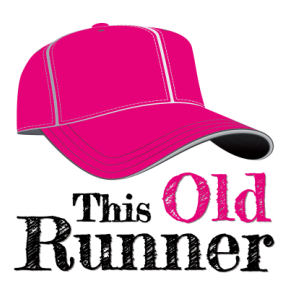 Read my personal recap of the 10k race.